Huge choice of odds and markets. High profile and big brand name. 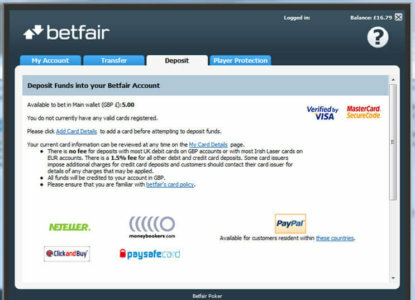 Betfair Group plc is the world’s biggest Internet betting exchange with more than seven million transactions per day, more than all European stock exchanges combined. The company was founded in 1999 by Andrew Black and Ed Wray. In 2000, the concept of a betting exchange was implemented, which was quite unique at the time. Honoring their business concept, the company received the Queen’s Award for Enterprise in the Innovation category in 2003. Currently the company is holding gambling licenses in nine different countries. As of April 2013, the company had 1,800 employees and more than 950,000 active customers. They have been listed on the London Stock Exchange until merging with Paddy Power on February 2, 2016. 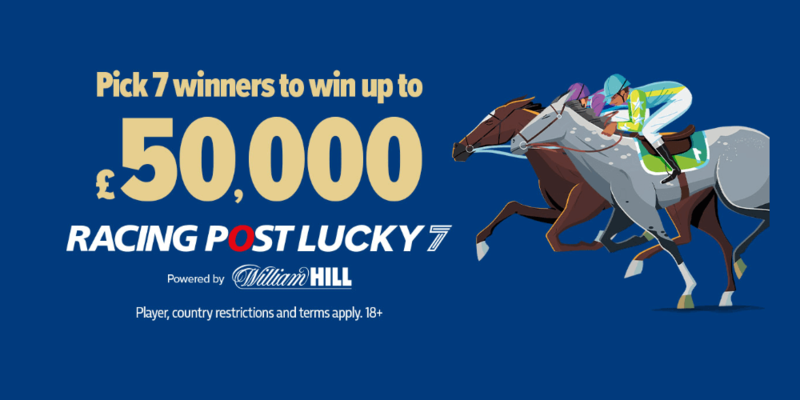 New customers from the UK & Ireland can earn up to €100 in free bets. Make sure to use our promotional code ‘ZBBC01′ when signing up and deposit a total of €10 either by debit/credit card or PayPal (please note, e-wallets are excluded). 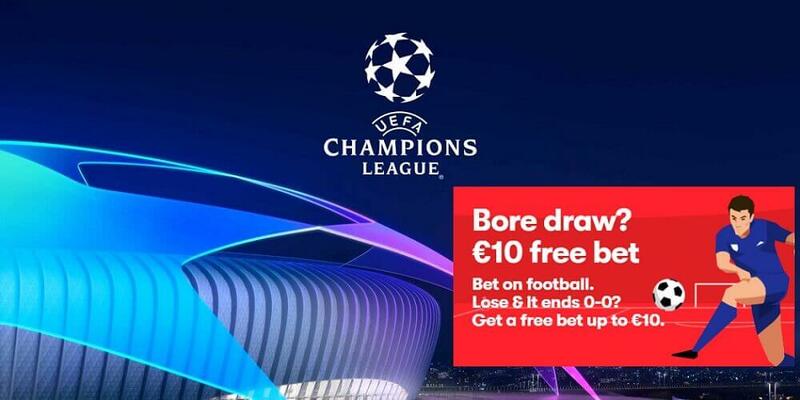 Then, you will need to place a single bet (minimum stake €10) at odds of at least 1.2 within 30 days of opening your account (exchange bets are also excluded from this promotion). Min odds 1/2 (1.5). Exchange bets excluded. T&Cs apply. Our following step-by-step guide will show you how to easily set up your account within a few minutes and benefit from our fantastic €100 in Free Bets offer. Please make sure to use our sign-up link to start the free registration process. You will be redirected to their homepage, where you just need to click the ‘Join Now’ button in the top right corner. 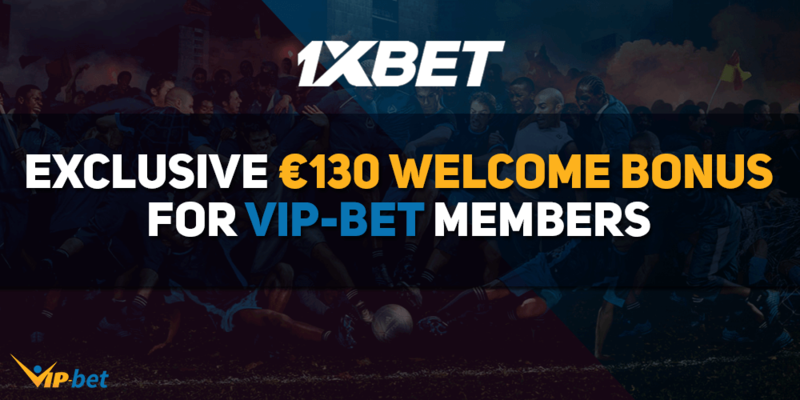 Make sure to use the code “ZSK200” to become eligible for our €100 Free Bets Offer and all other benefits. 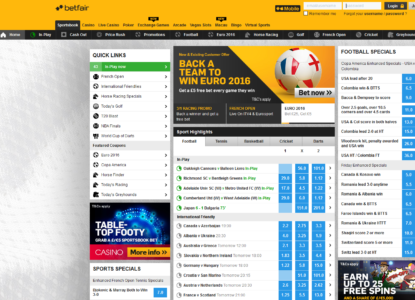 Our Betfair review would be worthless without a detailed overview of their betting coverage. Overall the sporting selection is greater than what is offered by most other bookmakers. All of major sports and leagues are covered and there are usually a lot of betting markets for each fixture. 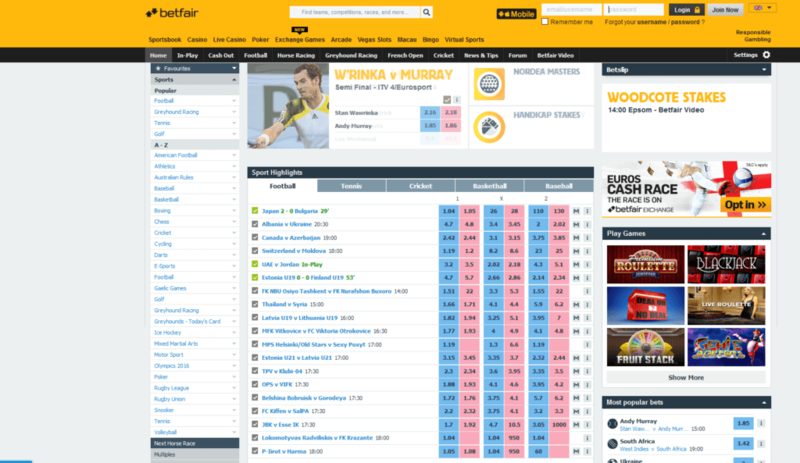 Betfair is a solid choice for every sports bettor. However, new bettors might need some time to get used to the interface and all options, because it’s not as beginner friendly as a standard bookmaker. ESports fans should also check out our Betfair eSports Sportsbook Review, where we have focused a bit more on the benefits for eSports betters. 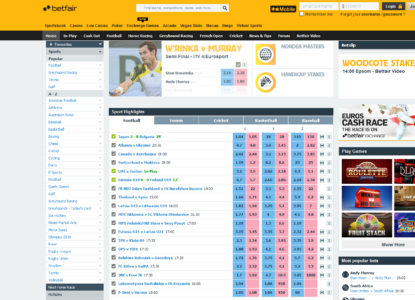 The Betfair sportsbook covers most markets and offers above average odds for many markets. However, even if their odds are “okay”, you definitely should check other sportsbooks and compare to find the best available odds for your preferred events. With our Odds Comparison Page, where we provide you with an overview of the best odds for different events through different sportsbooks, you can easily find the most profitable sportsbook to place your bets. Give it a try and see how easy it can be to maximize your winnings by just picking the best site to place your bets. Betfair has a pretty good coverage for live betting. You will find live betting markets for almost all events, including some more exotic areas like politics or financial. Fans of live betting will also find everything they need to have a great time. 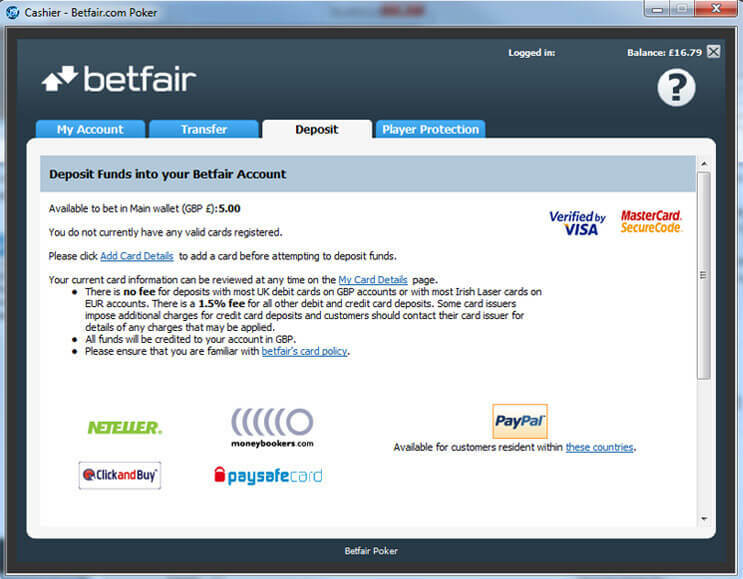 Even if you have never tried it, Betfair is a good place to start. Despite our focus on the main aspects of a decent bookmaker we also want to provide additional information in our Betfair review. Therefore it is necessary to mention, that the company is also offering live video footage. Betfair’s live streaming service is called Betfair Live Video. You can find many events which will be streamed and especially fans of greyhounds and horse racing will love it. Also feel free to check our in-depth Betfair Review of the live streaming service here. 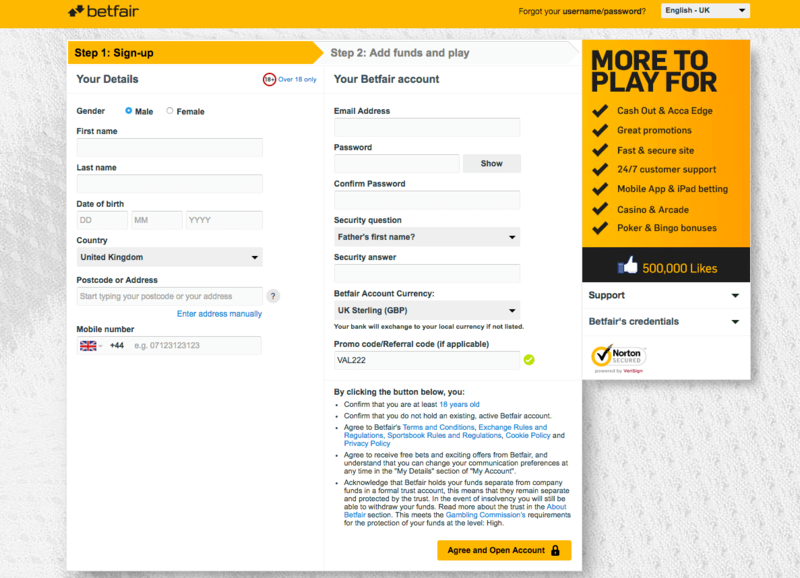 Betfair offers a decent range of payment options so that every customer will find a way to easily deposit into their sportsbook accounts. The following table gives you a quick overview about the most important payment options and their fees and limits. 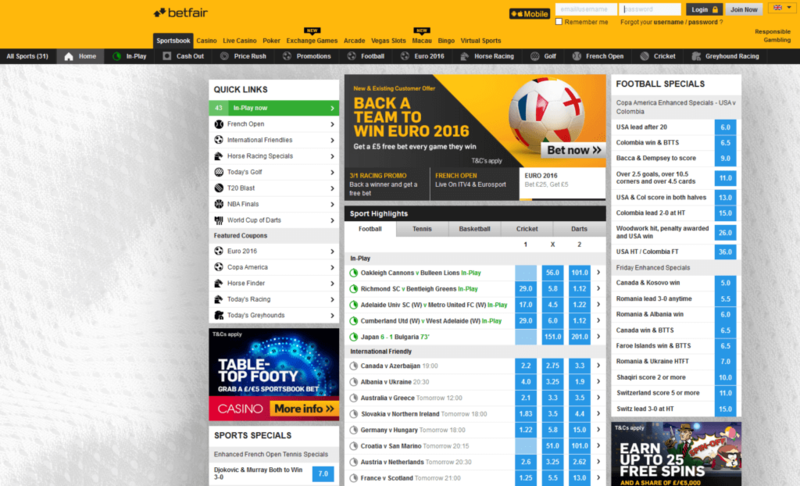 Even if Betfair is definitely one of the bigger players on the market, their promotions could be better. However, there is still some additional value in it and you should regularly check our review page to not miss any new promos. Cash Out – You can cash out your placed bets on many events even before the match has finished. Acca Edge – If one selection of your 3-folds or higher lets you down, you will get your initial stake refunded. Acca Edge is available on all sports and markets, including In-Play bets. Double Winnings – Place a pre-match Correct Score bet on the selected Premier League fixtures- if it is a draw at half time, your winnings will be doubled on that match. The maximum stake is £/€10. The founders were professional gamblers who started their exchange market business in 2000 with the Epsom Oaks (a horse race). Even though the betting market for that certain event was quite small, the media echo was excellent. The start of the betting exchange was considered nothing less than a revolution in sports betting history. Following these great reviews many sports bettors were attracted by that new market and the Betfair success story began. 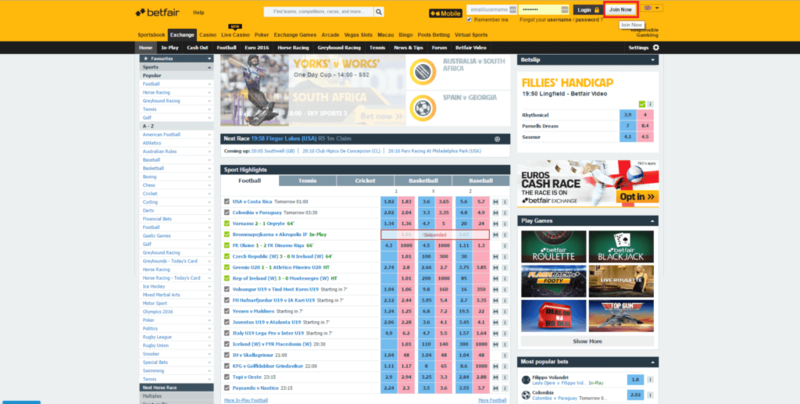 The ability to trade and place bets against other players offered great value to the new customers. The company claims that they offer 20% better odds than traditional sportsbooks. In contrast to regular bookmakers, they only charge a commission on all winning bets, set at 5 percent of the net winning, although depending on how much a client wagers on the site the commission can be reduced to as low as 2 percent. In 2005, the bookmaker purchased the online poker site PokerChamps.com, integrating the back-then new independent software, cancelling their previously used software from CryptoLogic Inc.
Their Poker branch is now part of the iPoker network. In 2012, a fixed-odds sports betting service was introduced. It was implemented in order to compete with traditional bookmakers. Right now in countries like Germany it is the only service the company can provide to their customers, because the legal status of the betting exchange has not yet been resolved. The UK based company has several gambling branches in different countries. In the United States of America their main company is TVG Network, based in Las Vegas, providing customers with horse racing, broadcasting live races, and race analysis. On top of that they also have a New Jersey based casino website called BetfairCasino.com. 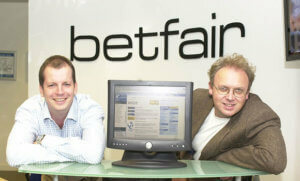 In November, 2005, the Tasmanian Government licensed Betfair, allowing them to enter the Australian Market. It was the second gambling license that has been awarded with outside of the United Kingdom. In 2014, the company was granted two online gambling licenses by the State Gambling Commission of Bulgaria. In the very same year, the undertaking introduced the betting exchange to the Italian market. 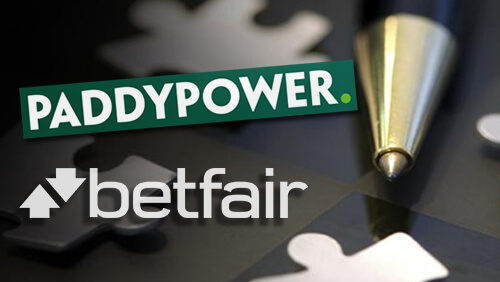 Betfair and Paddy Power announced in September, 2015, that both companies had agreed terms for a merger. Since that the enlarged entity, named Paddy Power Betfair, is based in Dublin. The companies combined their 2.4 million and 1.7 million online active customers to become one of the biggest gambling companies based in the United Kingdom. The merger was completed on February 2, 2016. Licenses: UK, Gibraltar, Malta, Spain, Italy, United States, Australia, Bulgaria, Denmark. Head Office: Hammersmith in West London, England. Betfair offers a native app for all Android and iOS devices. Through their app you will have access to update and cancel bets, in-play betting, place back and lay bets, betting history, and much more. You can use a mobile app for all your Android and iOS devices. The iOS app can be downloaded from the Apple Play Store. However, it is a bit more complicated with the Android app. The reason for that is Google’s strict policy against gambling and therefore they removed the apps from their store. However, most bigger sites are fully aware of this problem and provide a link to download the app on their sites and so does Betfair. To download the Android app just click the button and follow the instructions on the Betfair Mobile website. Please note, you will also find several other sources where you can download the android app, but we would highly recommend to not use apps from an unknown source and only use the original app from their homepage. 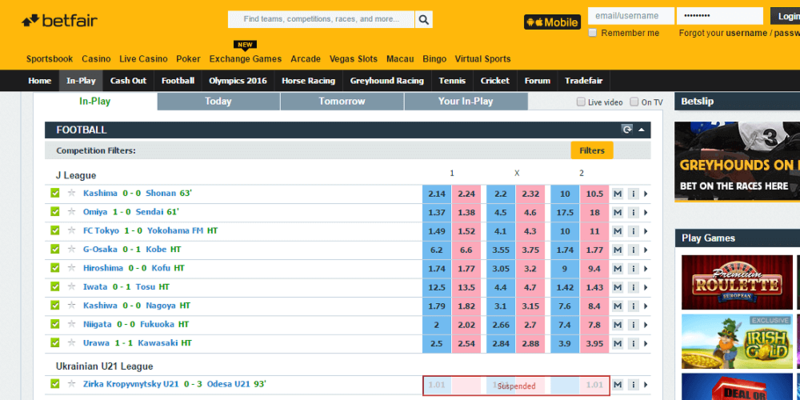 Odds Format: Fractional, decimal odds. 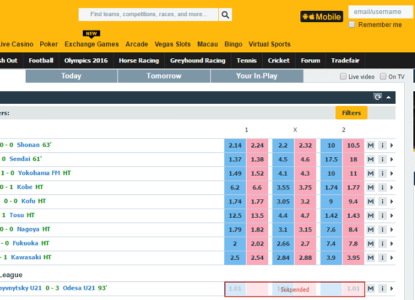 Live Betting: Huge variety of sports with, quickly updated, many betting types. 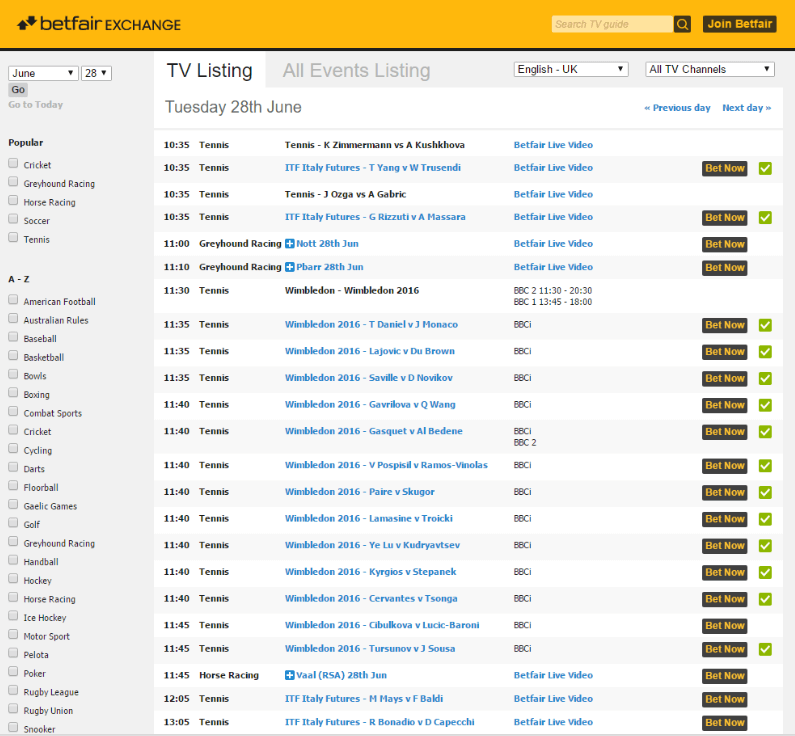 Live Streaming: Available, check: https://livevideo.betfair.com/ to see the Betfair streaming schedule. 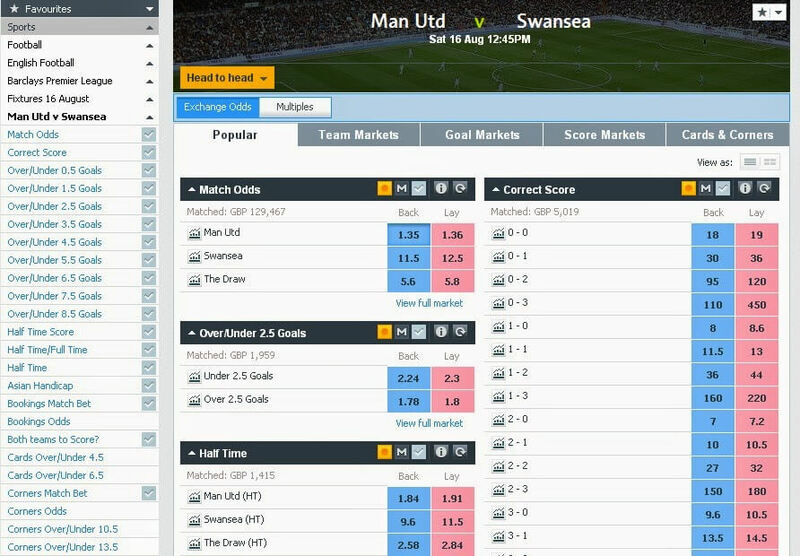 Betting Margin: Betfair offers two separate products: exchange and sports book, margin depending on which one you are using. The Betfair sportsbook service is available worldwide, but there are still a few regions where customers are not allowed to open an account. Check the following overview to see all regions where you are not allowed (orange) to open a Betfair account and where you are allowed (blue).